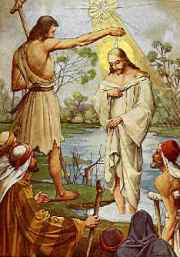 Catholic Holy Water - To the right is a depiction of Jesus' baptism in the waters of the Jordan River by His cousin, John the Baptist. This event also happens to be the first Luminous Mystery of the Holy Rosary. Just as water cleans our bodies, it has come to universally symbolize the inner cleansing of our souls. 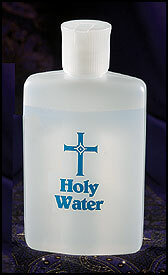 The Catholic Church uses water blessed by a priest as one of its 'sacramentals' - a substance used in a physical manner to impart a spiritual grace. The Church uses holy water most prominently in the Sacrament of Baptism - whereby the stain of original sin is removed from the soul, then joined to the Mystical Body of Christ - and, to bless the faithful during the Easter Liturgy (mass). for prayer time and, of course, rosaries!